Fill a tall glass with ice. Add dill pickle vodka, and next 4 ingredients, through pickle juice. Stir well to combine. Season with salt and pepper using measurements above, or to taste. Garnish with dill pickles, a celery stalk, and other veggies. 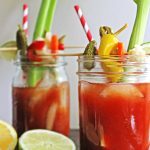 Get this recipe for Dill Pickle Bloody Mary at https://www.theworktop.com/breakfast-brunch-recipes/juice-drink-recipes/dill-pickle-bloody-mary-rhubarbarians/.